Create a two-week instructional unit on a topic of your choice, drawing on learning science. Use a backwards design approach (learning goals — > assessments — > instructional activities). Write a plan for a controlled experiment that could be implemented in a school. I wrote an instructional unit to teach 5th graders concepts, procedures and dispositions relevant to design thinking. I created a plan for a controlled experiment that would test the effect of student choice on self-efficacy (belief in one’s ability) and actual performance. Here’s my presentation poster, and an abbreviated report. I appreciate design thinking as a set of tools for problem-solving that’s centered on the current reality and a target audience. The first time I was really exposed to it was as an interviewee. One of my heroes, Dan Coleman, was asking me about my experience as a teacher, to help the company TeachersConnect understand their target users. (As an aside, I worked for a short time with TeachersConnect) . 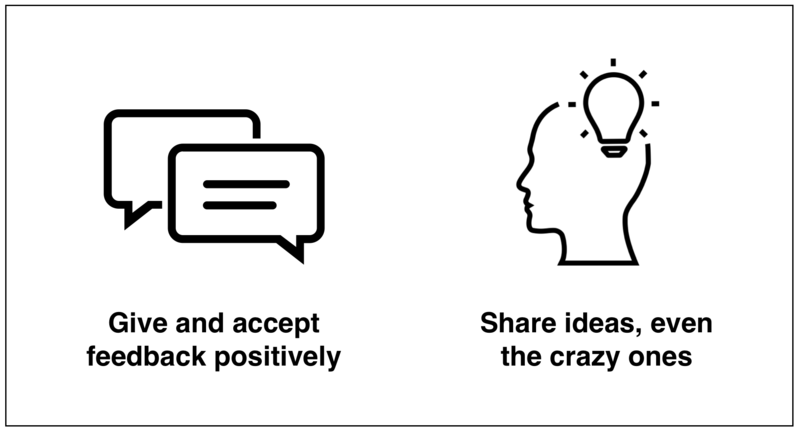 To me, design thinking means a bias towards action, and one of its advantages is that it tends to lead to developing products and services that people that are more likely to use. Our class read The ABCs of How We Learn, and it completely changed my perspective on teaching. Many of the instructional activities were based on the principles in this book, and backed by high quality research. It begins by giving students a lens through which they can look at the world around them. The intention is for them to be able to look critically at objects and answer the questions who is this for and what is it for? Then, students tackle a design challenge: how can you improve the morning of a classmate? In doing so, they get to know one of their peers, create a journey map, brainstorm ideas, and validate them with their partner. In the end, they invent something a peer can use between the time they wake up and the time they leave the house. 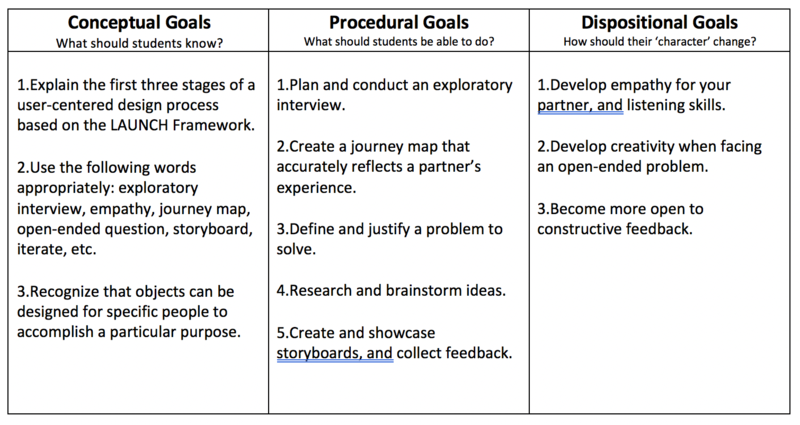 Based on my knowledge of design thinking, and interviews with project mentor Shelley Moertel, I developed goals for what the unit should teach students to know, what they should be able to do, and how their “character” should change. For each and every of the learning goals, I developed multiple assessments for a teacher to use. Creating valid and reliable assessments is one of the hardest jobs for a curriculum designer, because it requires integrating: knowledge of on the learning environment, creativity to not turn everything into a test, and exacting attention to detail to create detailed rubrics that are user-friendly and have a good level of objectivity. Tip: start to plan assessments before writing instruction, so that you stay focused on goals, but also iterate and add assessments while writing instruction. The assessments in Morning Booster give teachers multiple viewpoints into each of student’s learning. That is, the goals are assessed in more than one way. I proposed norms for the teacher and students – Norms, first studied by Erving Goffman, are a shared code of conduct. They’re useful because certain norms are useful for certain disciplines, and because they encourage desirable behaviors. The norms in this unit were: 1) share your ideas, even the crazy ones; 2) see constructive criticism as a way to someone trying to help you. Designing benefits from thinking outside the box, and this unit involves getting a lot of feedback from peers. I created activities using ‘contrasting cases’ – Learning from contrasting cases may have came from the study of expertise. A characteristic of expertise is being able to perceive small differences. For example, an expert in wine can perceive differences between wines on a detailed level. When beginners are given contrasting cases, they are able to see these small differences too. The activity below helps students see how balls have a more specific purpose than things to play sports with. Reflecting on this fact leads to a greater understanding of designing objects for a purpose. Students experience problems before an explanation for the teacher. For example, they are tasked with a short design challenge (design a new backpack for a peer) before the big challenge (design something that improves your partner’s morning). They tackle it without the teacher telling them how to do it. Teach students metacognitive skills – metacognition, or thinking about thinking, lets people understand a task, evaluate what they know and don’t know, and then create a plan to learn what they don’t know. Teaching students metacognitive skills happens in two major ways. 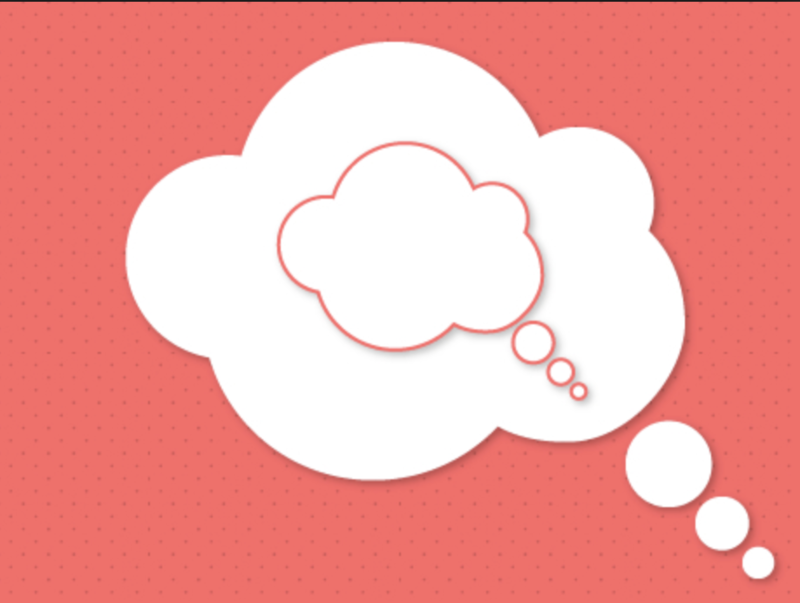 First, teachers ‘think aloud’ prompts to model thinking about thinking. Second, students frequently compare finished work with expectations of that work, which helps them reflect, and plan more intentionally in the future. Included ‘worked examples’ in the instruction – “Worked examples are models of expert solutions” (293, Schwartz et al). In this unit, the teacher shows students a step-by-step procedure, and explains each step, for conducting interviews. First, the teacher calls up a friend and interviews them about their morning. Then, the teacher re-frames the conversation in a worked example, by giving students a transcript of the conversation, and explaining her interview techniques for each question and follow-up question. Used analogies to help students make sense of new concepts – Analogies, as we all know, help us learn new principles, but they’re also important to teach because analogical reasoning is a good learning strategy on its own. When possible, I drew analogies between new concepts and concepts the students were likely to know. For example: curiosity and exploratory interviews, roller coasters and journey maps, and comics and storyboards (below).